Hi everyone, Lucy here, with another experiment! I first used shaving foam in crafting many years ago to marble inks and then dip pieces of card in. It was fun and messy, wasn't it? It occured to me that, as Fresco Finish paints dry very quickly, shaving foam might act as a medium to slow this down, enabling you to get some interesting effects. All you need is a can from your local pound shop and your craft space will smell like a Barber's! I have given three possible techniques here, and my example project uses an 8 x 8 inch chunky canvas, with layers built up using the same shades of Fresco paints and Ellen Vargo Eclectica stamps 06, and finished off with a bloom from Ellen Vargo 10 and text from Eclectica Lin Brown 05. A fuller tutorial is on my blog. First of all shake the can and squeeze the shaving foam onto the lid of a large ice cream carton or similar so you have a single layer. Add your drops of Fresco. 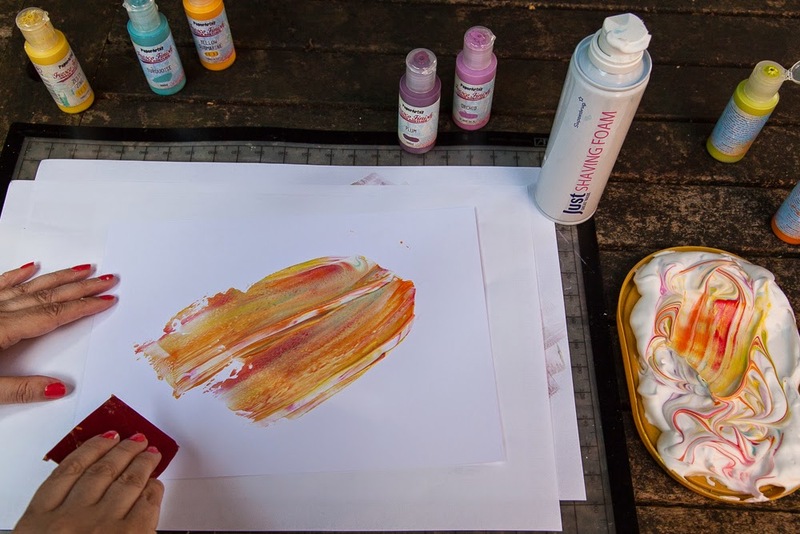 I have used Cherry Red, Yellow Submarine, Zesty Zing, Limelight, Tango, Orchid, Plum, and Turquoise. I tried out my colour combos first on cheap copier paper and I found I only needed one drop of the last three colours and about three drops of the other colours so you may want to see what colours you like best. I then used Smoothy Heavy Weight Card as it takes the wetness of the foam well. Use a wooden skewer to slightly swirl the colours. 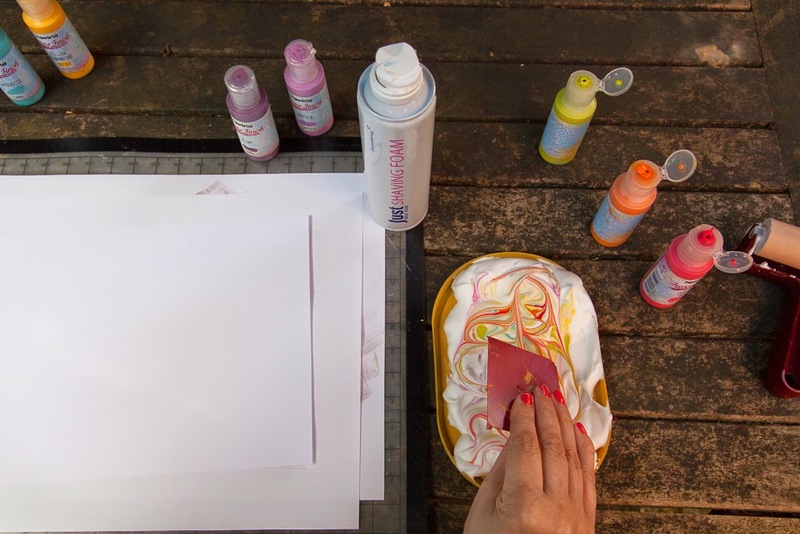 You are not looking to create a particular pattern, just to break down the blobs of paint and distribute them slightly. Don't overmix. For the first technique, using the brayer, pass it lightly over the surface to load it up with painty foam. It won't really roll across as there won't be much traction. 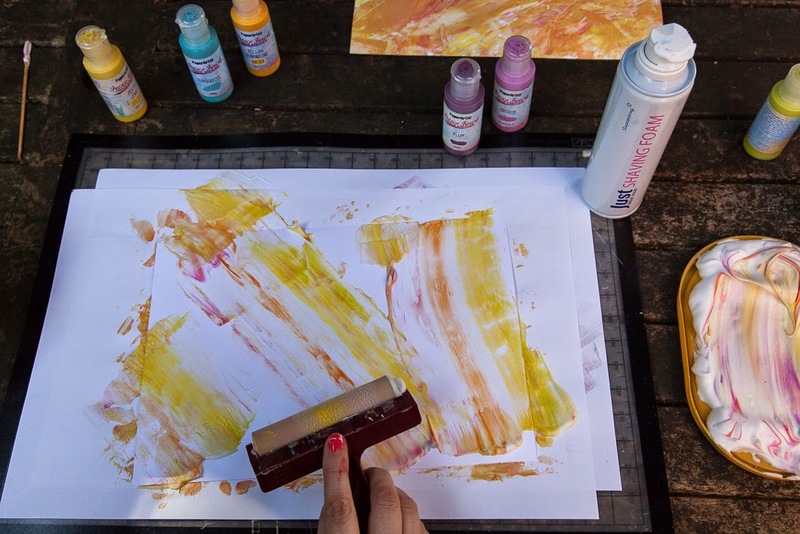 Roll the brayer across your card and reload if you need more colour. You can add more paint to the foam and mix again if you need to but a little paint goes a long way. Carry on until the card is covered to your liking but try not to go over the same area too many times and muddy it. You can see a piece I have done in the background. Leave it to dry naturally or use a heatgun. The second method is to use a credit card, or in my case a rectangle of plastic cut from the lid of an ice cream carton. Add the paints as before and 'scoop up' about an inch of foam from the surface. Scrape it across your card and continue until you have filled up the piece. I have used exactly the same mixture and technique to cover the top and sides of my 8 x 8 inch canvas as the starting point of my project. 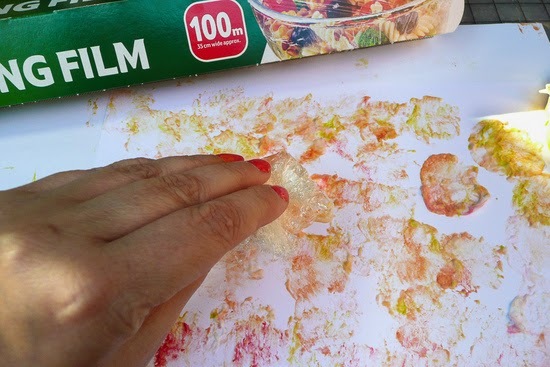 A third method to try is using cling film. Screw up a wadge between your fingers and use it to pick up some of the paint from the surface of the foam. Dab this all over your card for a lovely marbled effect. This method is more controlled than the other two. More details on my blog. Now over to you to explore the possibilities! You'll find this a very quick way to make backgrounds for cards, etc and the serendipity aspect is such fun! How about some metallic or pearl options? I haven't even tried that yet! A huge thanks to Lucy from PaperArtsy HQ. these are fabulous experiments, the marbled effect is just so pretty. 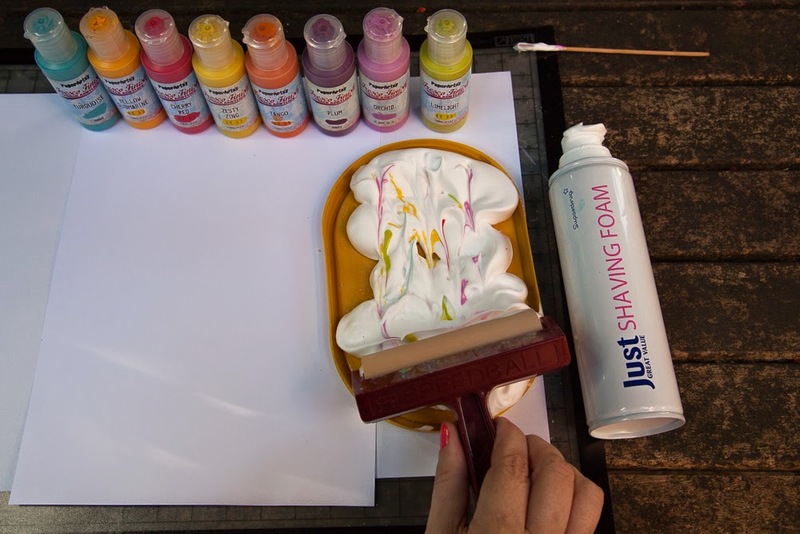 Shaving foam is the ideal carrier and smells so much nicer than the old fashioned marbling inks. 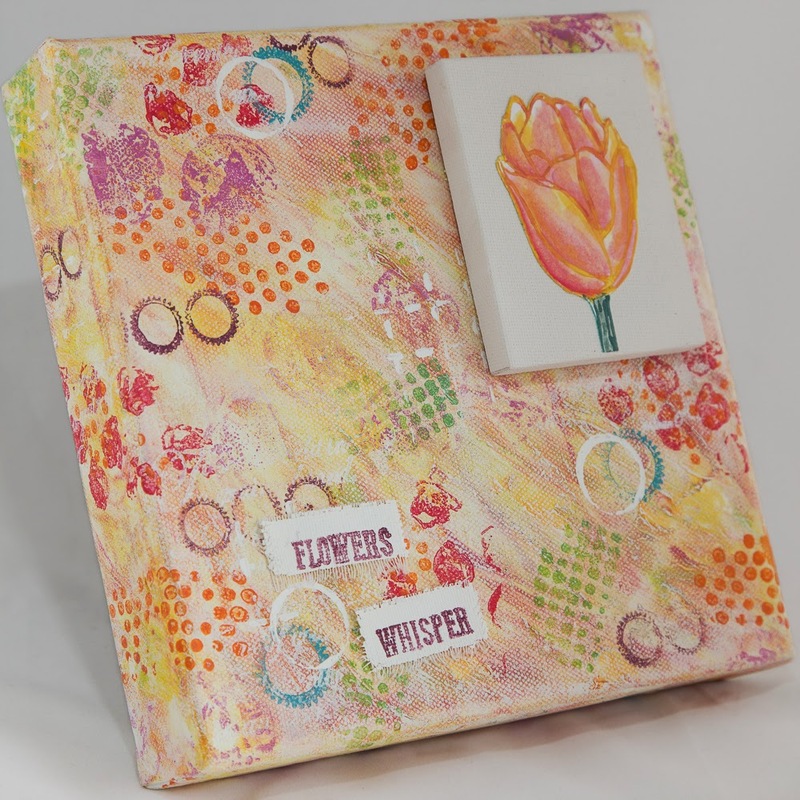 The uses for this background technique are so varied, from canvasses to cards tags and journal pages. I wonder could this work on fabric too? who is up for trying it..
All the years I've been crafting I've never tried the shaving foam technique. But you just might have inspired me Lucy, that canvas is terrific. wow, great effects, Lucy - been a long time since I played with shaving foam, but may be time to give it another go! I tried shaving foam once... the dirty looks I got from the man...But it looks so much fun! Awesome Lucy. I remember shaving foam being one of those things back in the day that we all had a go at. But you have gone waaaaaaay outside the box here! Loads more ideas! Awesome. I haven't used shaving cream with inks or paints in years!!! Very cool ideas!!!! Gorgeous canvas and this looks like so much fun! What great techniques - and with such a cheap ingredient! Love them. Must try this myself. Terrific canvas. It looks like a lot of fun as well, and just love the colours! Such a fun experiment - and absolutely gorgeous results!